It would help us a lot if each bug report will be associated with the following technical support background information about the particular computer. 1. What is your operating system (Windows, Mac OS, Linux, etc)? 2. What is your browser (Internet Explorer, FireFox, Opera, etc.)? 3. What is your Flash Player version? To determine it, open the page http://www.macromedia.com/software/flash/about/ and examine a box titled “Version Information”. Does it look identical to the reference screenshot below? If the not please provide your screenshot. 5. If the page under question 4 appears properly, click on the “Play” red ellipse on the upper puzzle. Does the new window opens up allowing you to play the puzzle? If it opens up, though something seems wrong – please provide a screenshot. 1. Do your browser settings allow Java Scripts? 2. Do your browser settings allow Cookies? 3. Do you have any Internet Security (firewall) software installed except for the Windows standard firewall? a) Which and what version? b) Does it allow Java Scripts? I've posted all this already (including a screenshot showing no flash puzzle thumbnail buttons). Do you want me to post it again? Also, those of us using Macs use do not have Windows Firewall! 3. What is your Flash Player version? To determine it, open the page http://www.macromedia.com/software/flash/about/ and examine a box titled “Version Information”. Good question. It is the one I downloaded when you changed the Website. 4. Open the page: http://www.conceptispuzzles.com/index.aspx?uri=puzzle/pic-a-pix. Does it look identical to the reference screenshot: http://www.conceptispuzzles.com/forum/upfiles/PapScreenshot.jpg? If the not please provide your screenshot. Yes, it looks like my screen. 5. If the page under question 4 appears properly, click on the “Play” red ellipse on the upper puzzle. Does the new window opens up allowing you to play the puzzle? If it opens up, though something seems wrong – please provide a screenshot. Yes, I can play this puzzle. Everything was fine for years, but now, when a puzzle opens and it says "done" no puzzle is seen within the window. I haven't done any new program downloads recently, and the "coockies" state is "on" as always. Two things may be responsible for the situation you experience: either the download speed is low or something went wrong with Adobe Flash Player. If refreshing the page a couple of times dosn't help, please download and install the latest version of the Player: http://get.adobe.com/flashplayer/. Status: offline Hi I have been a member for lots of years and the system will not let me do the free puzzles? I do not want to pay for puzzles as I already subscribe to a Conceptis magazine. Many things have changed on the Conceptis website, but there are still free puzzles every week and you can continue solving them. You don't have to pay for additional puzzles and features if you don't want to. Status: offline 1. What is your operating system (Windows)? 2. What is your browser (Internet Explorer.)? 4. 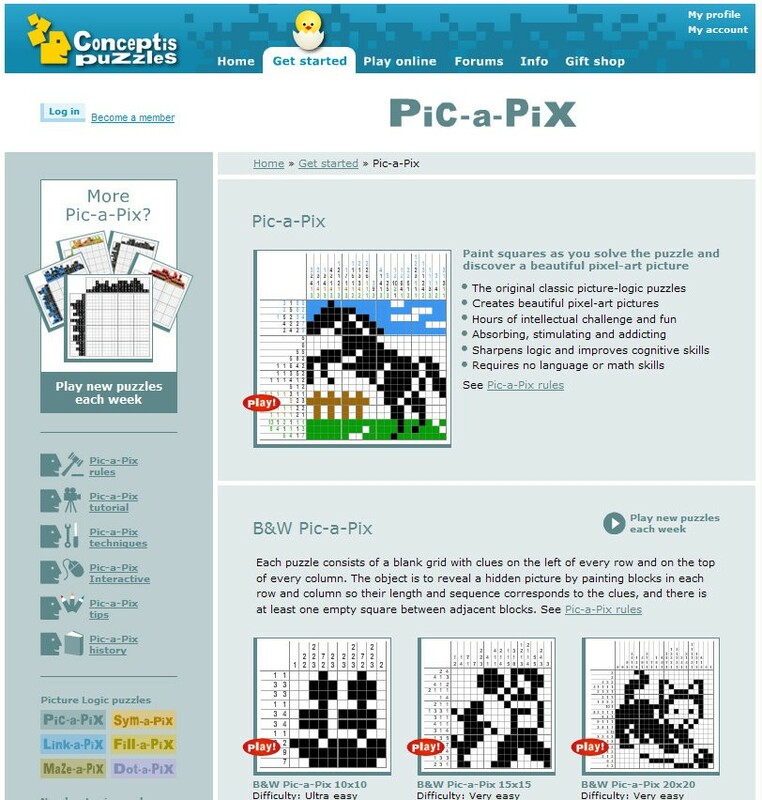 Open the page: http://www.conceptispuzzles.com/index.aspx?uri=puzzle/pic-a-pix. Does it look identical to the reference screenshot below? no! but I don't see the images or the red ellipse. I will be so happy!!! Does it look identical to the reference screenshot below? - No the page does not disply any of the puzzles instead i have a blank box with a red X in the corner. Please can you tell me what i need to do. Something must have gone wrong with Flash Player installation. Please reinstall it (http://www.adobe.com/products/flashplayer/) and make sure to restart your browser. Status: offline Linda, just to make sure: did you install the downloaded player and restarted your browser? Status: offline Yes i downloaded flash player and restarted the browser. i now have version 10,1,102,64. Linda, just to make sure: did you install the downloaded player and restarted your browser? Status: offline Not sure how i go about doing that. so i have tried to send it you but it did not put in the empty boxes with a red cross in the upper left hand corner. Status: offline I'd prefer an option to choose a "click for fill, shift-click for X, ctrl-click for delete" scheme instead of the current click-double click-triple click" one which is very prone to misclicks. Status: offline I only see text, but I do not see the images or the red oval. I can not enter the game / can I help me? I would be so happy! I'd prefer an option to choose a "click for fill, shift-click for X, ctrl-click for delete" scheme instead of the current click-double click-triple click" one which is very prone to misclicks. Me too! (I assume by "shift-click for X" you mean shift-click for dot.) Also, I'd prefer alt/option click for "make blank" instead of ctrl/command click, because it is more consistent with standard UI principles. Nearly all of my errors originate as missing the cell I'm aiming for and not noticing that it toggled a neighboring cell instead of filling the one I meant. Status: offline Good morning. My computer has numerous users with similar access. Conceptis online play works on some logins and not on others. On some the images do not appear nor do the links. The image placeholders have a red "x" in the top left corener. Note: IE 8 and the most recent version of Flash.